There is nothing more glamorous than a diamond bezel watch. Add Swiss made, what’s not to Ike? I did buy this for an adult so I’m sure it was property cared for. I think this may be a little too delicate for a younger wearer. But worth a try. 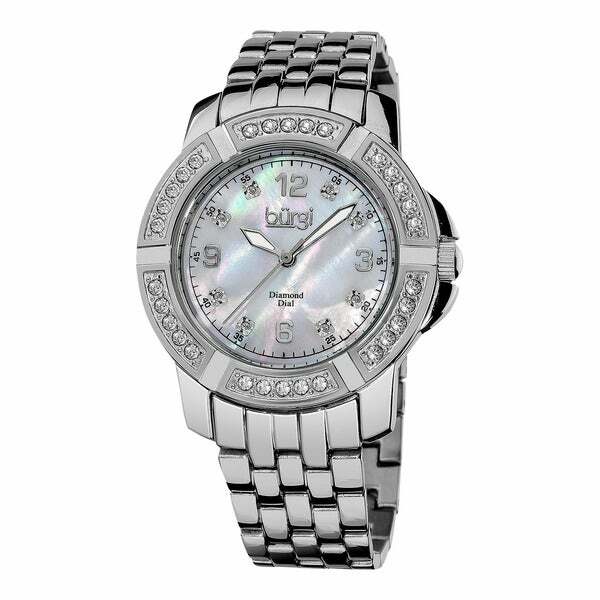 Choose a timepiece that highlights your sense of style with this Burgi women's stainless steel bracelet watch. Mother of pearl on the dial combines with crystal accents on the bezel to produce a shimmering effect every time you move your wrist, and the hour markers include eight genuine diamonds between the modern-looking Arabic numerals for a sophisticated look. Our 15 yr old daughter had been wanting and looking at a large variety of over sized watches and I found most of them to be too large for her petite frame and many of them too expensive for our budget. I stumbled across this one on overstock and it had all the features that our daughter had been looking at, with one exception it was much more elegant but yet sporty and the price was perfectly within our budget. She absolutely loved the watch when it arrived the box that it was in made it look even more expensive than the price we paid for it (which by the way, was incredibly reasonable for the quality that we received) She wears it everyday and has had many many compliments. We have had the watch for 6 months and have had no problems with it and while the band was a little too big for her dainty wrist we were able to take it to a jeweler to get it sized for about $**. I think we could have done it ourselves but... my daughter was afraid I would damage her "beautiful" new watch. I decided to take her begging and pleading to heart and took it to a jeweler. I would definitely recommend this watch especially for the price. Great quality and great price. Being Allergic to most metals, it is difficult to find a Swiss Quartz Watch unless I can afford to buy one in Real Gold. So Naturally, I check out Overstock and as always..... I find this Brand New, Absolutely Beautiful, Burgi Diamond, Swiss Quartz, Stainless Steel, Bracelet Watch! I Love and am Addicted to Overstock and do NOT want an Intervention! I am saving too much money! I never owned a gold watch so decided to shop for one that I could wear casually and most work days when not in a suit. This watch is perfect for what I wanted. I've received numerous compliments on it. It accents my gold jewelry with a flare of casual elegance. As other reviewers reported it was big and I had to have 5 links taken out but I'd rather have extra links than have it fit too snug. If you are looking for a small watch this isn't for you but if you are looking for a larger face with flare you won't be disappointed. This is a beautiful and expensive looking watch. It is a larger watch which is so trendy now. Great buy. 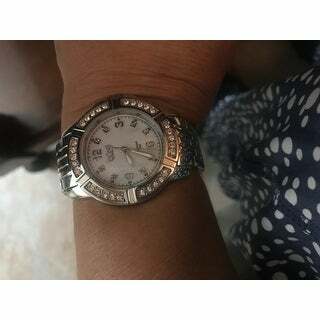 Watch is gorgeous with mother of pearl face and diamond accents that really look great with silver colored mounting and bracelet! Watch is oversize and has worked flawlessly! So pleased with watch that I am seriously considering getting it for wife in gold and rose gold colors also! Very showy and looks worth much more than it costs! Workmanship is flawless and does not look at all like cheaper poorly made crystal accented products that are available on the market at similar or greater cost! The watch was beautiful, but huge and VERY heavy, and I'm not a smallish woman. I knew I'd feel like I'd been to the gym if I wore that all day! I could not pass up this deal when I saw it. My wife had been asking for a watch like this, but the ones she showed me on other websites were 5-10 times the price here on Overstock. Personally, I don't understand why anyone would wear a watch when they have the time on their cell phone, but I really don't grasp why women love jewelry either. Making this purchase was a real hit though. She loved the color and the style. Took it too the local jeweler to be sized (most women will need to have a few links removed from the band) for under ****. Even the jeweler commented on how nice the watch was. I got the Rose color and my wife absolutely loves it. A real bargain at the price. I had a problem with the first watch I received not telling time. Replaced the battery, but it still didn't work. Customer service was great. Sent out a new watch the same day with a prepaid label to return the defective one. The second watch is keeping time beautifully and is a nice watch. I've started wearing these less expensive watches for everyday use to spare the wear and tear on my good watches. This is a good value for the price. This watch is a very pretty and expensive looking. I took it to a jeweler to have it sized and he actually complimented the watch and didn't believe the price I paid for it. Well soon after I was setting the time and the pin came out but the watch continued to rum until the battery died. Again, much bigger than shown. No warranty, instructions, nothing. I have to take it to a jeweler to fix the huge amount that has to be taken off. There goes the savings. I have not been able to enjoy the watch because it has too many links. I will have to take a couple out for it to fit my arm snuggly. I returned this watch because it was too large and heavy for my arm. I think you need to be looking for a bold look or have a large frame to wear this style. This watch is so beautiful. I’m so happy with this buy! Burgi is one of my favorite brands in watches- couldn’t believe the incredible prices in Overstock. Thank You! The watch is pretty but very large. It’s to big for my small wrist. It’s the size of a men’s watch. I am returning it. If you like big you can get it sized to fit. I purchased this watch for the classy look it offers. The quality is nice, it is feminine but not "girly", it can been seen across a room, it commands compliments. The watch came a bit to big for me, so I went to my jeweler and had a few links removed. I wear it daily and has a nice flash /bling to it. The watch is kind of big and chunky and I really just didn't like the way it looked when I got it. It's still in the box. "What kind of batteries does this watch take?" The battery code is SR626SW. I needed a elegant high quality watch to go with business attire. Thank you for shopping with us dratone. It is not shock proof. Have a great day. "What is the manufacturer's guarantee for this watch?" We are glad you found your answer. please let us know if you have further questions. "How are the links removed to make it smaller?" Hello gabehorse, we recommend having the links removed by a local jeweler. Typically they will do this for just a few dollars. Thank you for shopping with us, and have a great day! "can links be removed to make smaller"
Yes this band is adjustable. "Does this item come in gold tone and is it waterproff?" It does come in gold tone, use the option tab to select. It is not water proof but water resistant.